Onomichi had played a key role as an important strategic port from the time of the Middle Ages. Warehouses were built in 1168 and a large amount of annual tribute from Bingo Otanosho was kept there. In 1169, it was recognized as an official port. Onomichi Port began to prosper as a sending off port of annual tributes, and vessels called "Kitamae Ship" which connected Hokkaido to Osaka began making port calls in the Edo period. It is said that when the "Kitamae Ship" made a port call, the whole town bustled with activity. Due to the great prosperity, some people became very wealthy. These people were called "Gousho" (wealthy merchant), and they invested their wealth in the construction of temples, the maintenance of the city, and other projects. Those temples and much of the city's atmosphere that is easily seen today is an outgrowth of those great fortunes and the desire of the Gousho to create abundant beauty. For more information, call or visit Onomichi Historical Museum or Onomichi Chamber of Commerce Memorial Hall. From the Jomon Period (about 5000 years ago) the remains of an Ota shell heap was found in Onomichi. 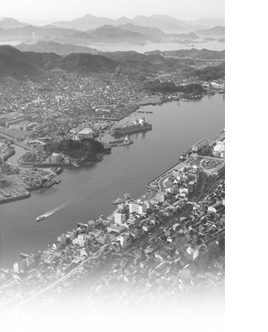 Onomichi has a long history over 800 years since the Onomichi Port was admitted as an official port in 1169. 901 Sugawara Michizane makes a port call at Onomichi on his way to the city of Dazaifu in Kyushu due to his demotion. This is the origin of the Misode Tenmangu. 1166 The properties of the warlord Taira Shigehira in Ota and Kuwabara area in Bingo district are donated to Emperor Goshirakawa. 1169 The port of Onomichi becomes an authorized port. 1186 Otanosho district is donated to the Konpondaido in Koyasan. As an annual tribute, rice produced in Otanosho is shipped to Saika in Wakayama Prefecture through the port of Onomichi. This is the origin of the opening of the port of Onomichi. 1336 After the Kemmu restoration, Ashikaga Takauji is demoted to Kyushu and aspires to come back. He makes a visit to Jodoji Temple on his way to Kyushu. (It is the origin of Yoshiwa Taiko Odori, Taiko Drum Dance). 1389 Ashikaga Yoshimitsu makes a port call at Onomichi on his way to visit Itsukushima Shrine. 1395 Ashikaga Yoshimitsu donates Onomichi to Koyasan Saito Temple. 1592 Carpenters and masons in Onomichi migrate to Hiroshima and form Onomichi Town. 1597 Shibuya Yoemon, a wealthy merchant in Onomichi, is involved in maritime transport at the time of the Korean invasion. 1601 Onomichi is designated as "Onomichi-mura" and "Onomichiura-mura" due to Fukushima land survey. Okubo Nagayasu provides the Iwamiji roadway between Iwami Ginzan Silver Mine and Onomichi. Silver produced there is brought to Onomichi through Iwamiji roadway and shipped to Osaka. 1619 Onomichi becomes a territory of the lord Asano. 1638 Due to the Asano land survey, "Onomichi-mura" and "Onomichi-ura" become "Onomichi-cho". 1740 Hirayama Kakuzaemon (an honorary citizen) becomes the magistrate of the town and starts land-filling the Sumiyoshi beach. He also constructs a covered alley for mooring ships. 1741 Land filling of Sumiyoshi beach is completed. Sumiyoshi Shrine is moved from Jodoji Temple. 1834 Tanomura Chikuden comes to visit Onomichi and stays at the home of Hashimoto Chikka. Hashimoto rebuilds the main hall of Jikanji Temple as a relief work project to combat a severe famine. 1871 Bingo District is attached to Hiroshima-prefecture and Onomichi-cho to Mitsugi-gun due to the abolition of clans and the establishment of prefectures. 1894 Miki Hanzaemon (an honorary citizen) starts developing Kyorakuen (later named Senkoji Temple & Park). 1895 The Onomichi branch of Sumitomo Bank opens. 1898 Onomichi City is municipalized. 1912 Shiga Naoya stays in Onomichi. 1918 Hayashi Fumiko moves to Onomichi. 1921 The sea route between Incheon, South Korea and Onomichi is opened. 1923 Construction of the water supply system is started due to contributions from Yamaguchi Gendo (an honorary citizen). 1935 The first Onomichi Minato Festival (Port Festival) is held. 1953 The main hall and surrounding grounds of Jodoji Temple is designated as a national treasure. 1965 The Path of Literature is completed. 1968 Onomichi Ohashi bridge opens. 1975 Kenpon Chakushoku Fugen Enmyo Zo (Statue) in Jikoji Temple was designated as a national treasure. 1982 "Tenkousei (Transfer Student)" directed by Obayashi Nobuhiko appears on screen. 1983 Innoshima Ohashi bridge opens. 1988 Shin-Onomichi Station for the JR Sanyo Shinkansen opens. 1999 Nishi-Seto Expressway (Shimanami Sea Route) opens. 2005 The film set of "Otokotachi No Yamato / YAMATO" opens to the public. 1336 Ashikawa Takauji wins the Battle of Minatogawa. 1338 Ashikaga Takauji establishes the Muromachi shogunate. 1592 Toyotomi Hideyoshi sends troops to Korea. 1597 Toyotomi Hideyoshi sends troops to Korea. 1603 Tokugawa Ieyasu establishes the Edo shogunate. The peak of silver output is reached at Iwami Ginzan Silver Mine. 1619 Asano Nagasaki changes his fiefdom to Hiroshima from Wakayama. The Hishigaki Kaisen (lozenge-fenced cargo ships) begin to sail regularly. 1635 Start of the Sankin Kotai System which obligated lords to live in Edo for a year (or half a year if their fiefdom was near Edo) to show their loyalty to the shogunate. 1671 Kawamura Zuiken opens "Western Sea Route". 1834 Famine of Tempo era. Revolt of Oshio Heihachiro. 1871 Abolition of clans and establishment of prefectures. 1894 Outbreak of Sino-Japanese War. 1904 Outbreak of Russo-Japanese War. 1912 Emperor Taisho ascends the throne. 1918 Outbreak of the Rice Riots. 1923 The Great Kanto Earthquake strikes the Kanto plain. 1941 Start of Pacific War. 1945 The war ends with the unconditional surrender of Japan. 1953 Start of TV broadcasting. 1965 The Treaty of Basic Relations between Japan and the Republic of Korea. 1968 Kawabata Yasunari receives the Nobel Prize in Literature. 1975 The Sanyo Shinkansen Line is fully opened. 1983 Release of the Family Computer. 1988 The Seto Ohashi Bridge opens. 1339 Outbreak of Hundred Year War. 1492 Discovery of the New World; Christopher Columbus. 1588 The English naval force defeats Invincible Armada. 1620 British Puritans' begin to immigrate to America. 1760 Industrial revolution; The U.K.
1877 Thomas Edison invents the phonograph. 1896 The first Olympic Games in the Modern era are held. 1903 The Wright brothers achieve the first manned flight. 1912 Scott reaches the South Pole. 1920 League of Nations is founded. 1957 The first artificial satellite is launched; USSR. 1969 Apollo 11 makes the first-ever lunar landing. 1986 Accident at the Chernobyl (Ukraine) nuclear power station. 1999 Portugal returned Macao to China.